I am super delayed in posting this, but we have been super busy with a billion new booktalking outreach programs! Last month, my staff met to discuss graphic novels. Although graphic novels are always an option for everyone to read for our Reading Wildly meetings, my staff members seldom self-select them, so they chose to have graphic novels as one of our genres this year. We started by discussing the article Using Graphic Novels with Children & Teens from Scholastic's website. This article suggests some great graphic novels, so it gave everyone a place to start if they weren't as familiar with this genre. It also gives examples of how teachers have used graphic novels in curriculum with success. 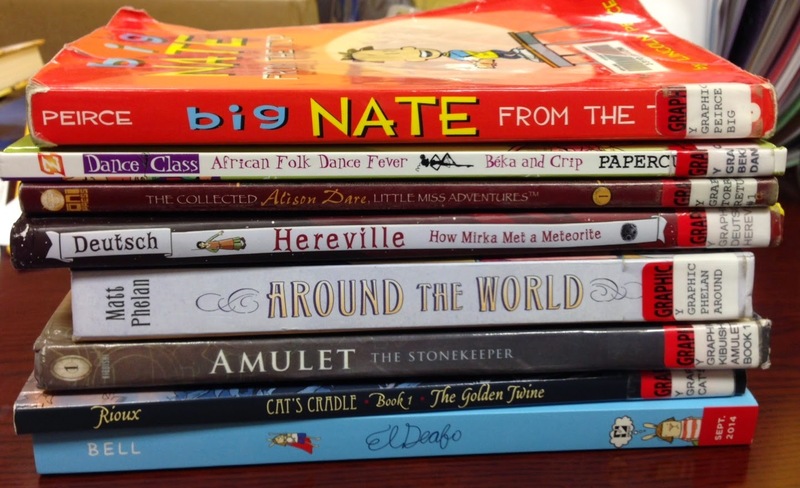 Lots of kids love graphic novels and they're an easy sell in booktalking programs. Bringing a graphic novel along on booktalks helps to balance what you're bringing and it validates for kids and teachers that we do consider this "real reading"! As you can see, we read graphic novels from many different genres - realistic fiction, historical fiction, fantasy, science fiction...! For our next Reading Wildly meeting (which has already happened... I'm so behind! ), we're reading Animal Fantasy. However, since we have all been working really hard on prepping for our booktalking programs, I've made the genre requirement optional. More on that next month!